Every mom in the universe wants to know how to make babies laugh. Baby laughter is the BEST. THING. EVER. We will act like complete and utter fools for hours on end just for a chance to make our baby laugh. Some babies laugh more easily than others. Both of my babies were (and I guess still are in some cases) quite serious. And when you have a serious baby, it makes you all the more determined to coax a laugh from your baby. You want the real deal. You want to know how to make babies laugh, while awake, because YOU are the funniest person in your baby’s world. I mean really, it’s the least our babies can do for us after all that we endured through pregnancy and delivery, right? Well, that and give us more than a couple hours of sleep at a time. That would be great too. The majority of babies laugh out loud between the ages of 3 and 4 months old. However, it is also common for some babies to start laughing much later than that. Remember that each baby is different, and some are simply more serious than others. Put your hand in the air and wiggle your fingers as they get closer to baby’s face. Then you can gently cover your baby’s face with your hand or tap your baby’s nose with your finger. Get a Fisher Price Giggle Gang Toy– It is a plush toy that giggles when shaken or squeezed. Make silly noises or silly faces- slurping sounds, animal sounds, etc. Play a funny sound on your phone or on your Amazon Alexa. Sing the Itsy Bitsy Spider while holding your baby’s hands- it’s the perfect song to make baby laugh because it’s so interactive. Sing- my first born didn’t laugh when I sung to her, but she did stare at me with the most precious look EVER like she was falling in love with me all over again when I used to sing to her. The feeling it gave me was WAY better than any laugh, so it’s worth a try. Give lots of eye contact while you’re singing too. 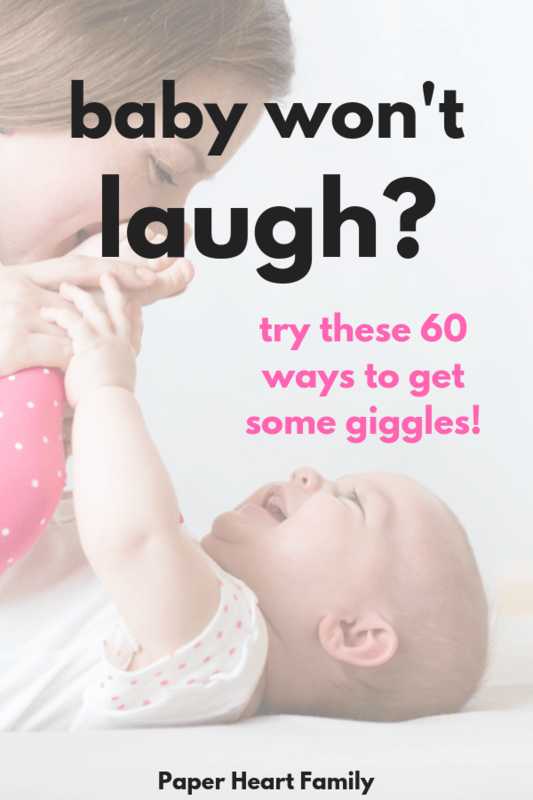 And if none of these 60 ideas can succeed in giving your baby the giggles, you might as well watch other babies laugh. 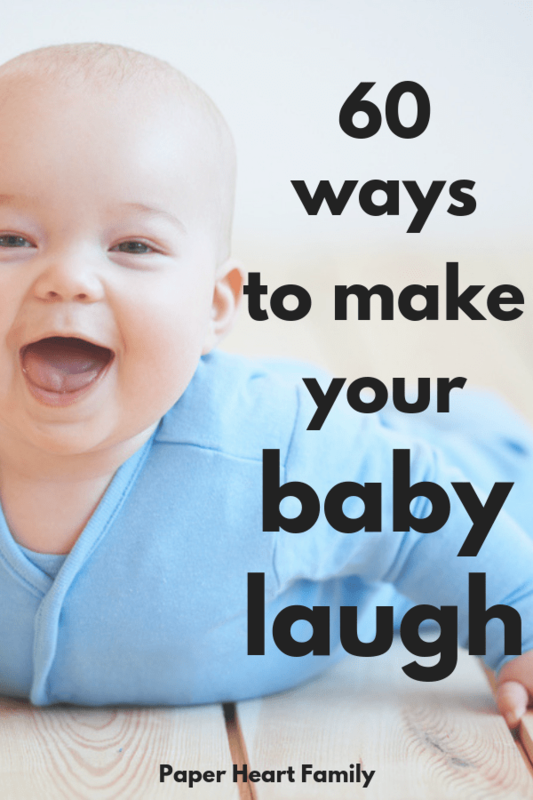 Let me know in the comments if any of these tips for how to make babies laugh work for your baby!